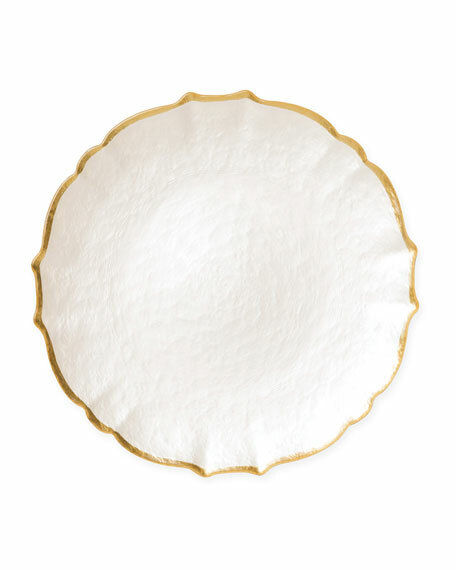 Be the hostess with the mostess and set the trendiest tablescape with the gold-rimmed Pastel Glass Salad Plate, the must-have table accessory your guests will adore. The origins of Vietri begin with a mother-daughter trip to Italy. Lee Gravely and her daughters Susan and Frances fell in love with the colorful design and artistry of the local handcrafted dinnerware. After spending a few days crafting their own dinnerware, the three were bound even closer together. They chose to name their importing company after Vietri sul Mare, the town where they created their first dinnerware patternCampagna.